Throughout the year, the Golf Lounge is a great place for taking a short break from your everyday routine. Just come by and visit us. We will always welcome you with a smile. 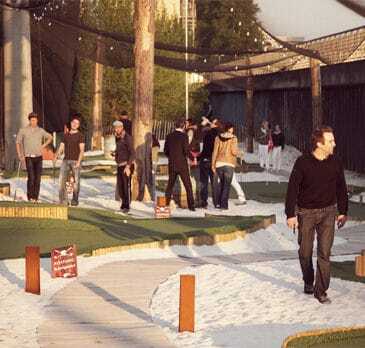 No matter if you enjoy your sundowner at the bar, play a game of miniature golf with your family or take the chance to network after hours: We offer one of the most beautiful places in Hamburg City. When do you have time? 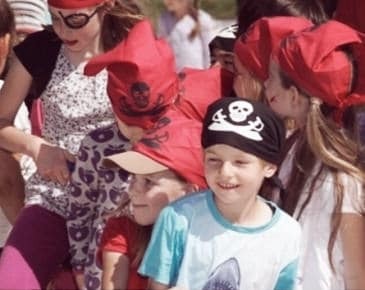 Fun for the whole family – ideal for the weekends: The 9-hole “pirates course“ offers exciting and diverse games with three alternative routes: easy/medium/advanced. It’s a challenge for all experienced golfers and a fun start into golfing for beginners. And there’s no rush: the miniature gold flatrate applies throughout the day. Pay for two and play with the whole family! Enjoy the summer on the patio – get cozy at the fireplace in the winter: The lounge bar is the heart of the Golf Lounge. Here, we welcome you when you arrive and provide you with all information needed. 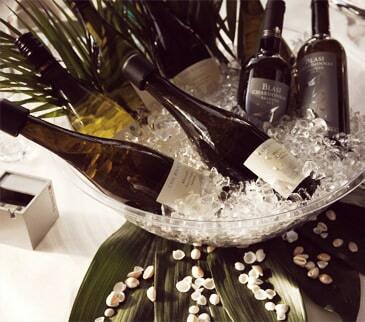 Here, you can relax after your workout with a glass of wine and review your tee offs of the day. And just because this is so nice, we will soon be making a lot more out of the lounge bar. Stay tuned! The Golf Lounge is the ideal place to hang out with the guys: If your buddies always wanted to play golf, just bring them with you, tee off some balls and enjoy a cold beer while doing so. 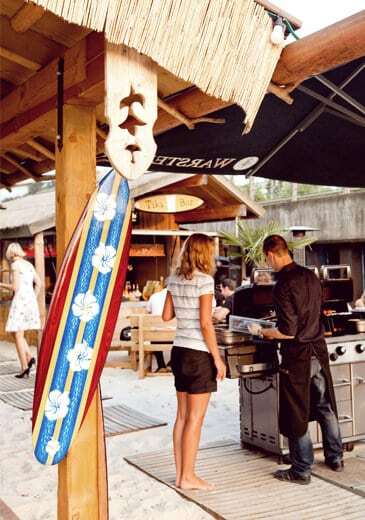 Or meet at the beach or lounge bar right away for drinks and bratwurst. By the way, we also broadcast soccer. 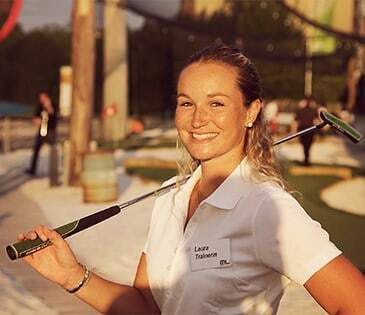 “Honey, what are we going to do on Sunday?“ Go play golf together: Just have a little fun teeing off or book an hour with a personal trainer to find out if golf is your thing. 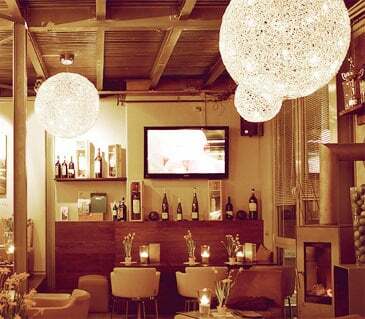 In every case, enjoy your Sunday in a great atmosphere and good food, listening to lounge music. 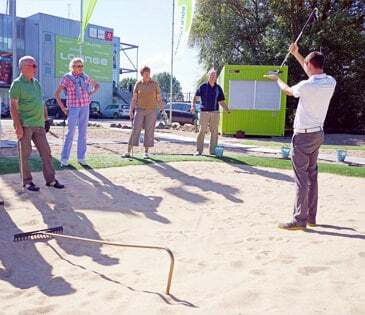 Meeting people, having cheerful talks during miniature golf, taking part in golf competitions and discussing the latest news – We want golf to be inspiring and to bring people together. If you’re through with talking about golf, just switch to soccer and business. What if it rains? Go to the driving range at the Golf Lounge. The three floors are roofed and a popular meeting point to talk shop, relaxation or swing practice. Visit us throughout the year, in the morning, during the day or in the evening – single or with your partner, children or friends. Teeing off is a lot of fun and motivates you even when the sun is already shining. The responsibility for the best man can be quite huge. How do you surprise bride or groom with something special that fits his or her expectations? We recommend: Take a boat trip and have fun with us! Whatever the husband or wife-to-be wishes for — play miniature golf at the beach club or join a round of group training, small catering included. Why not? You have 60 minutes, the car waits right in front of your door and you want to check out a new place for lunch? Just come by and visit us, eat a bite while overlooking the Elbe canal and tee off a few balls, afterward. Even after work, there is a lot of room for fun in the Golf Lounge: BBQ, beach club, driving range, after work club etc. 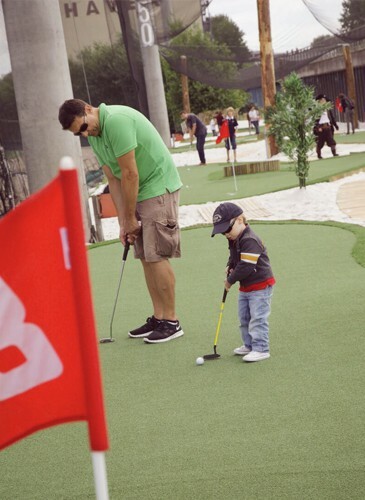 “What are we going to do with the kids this weekend?“ Run riot at our place: Find out if you have a hidden golf talent on the driving range or meet on the 9 hole “Pirates course“ for a family miniature golf competition. 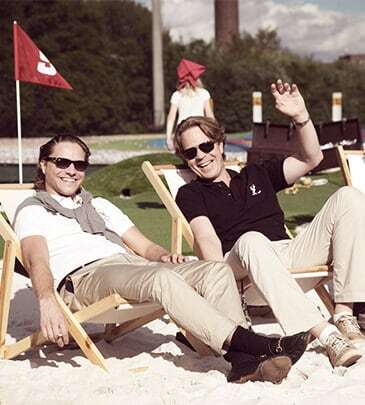 Dinner afterward is simple: have some bratwurst at the beach club and let your kids find new playmates in the sand. Do you just want to try out golfing? For some girls, it’s easier if they stay in the pack. Thus, the ladies night is perfect for them. 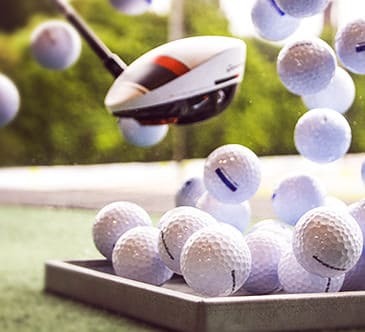 Practice the swing or other golf basics. Between you and me: A glass of champagne and a few snacks make all the difference. And perhaps you find your secret talent in golfing. Dip your feet in the sand and enjoy a cold drink: beach clubs are landmarks of Hamburg just like the rivers Elbe and Alster. A day at the beach club in the Golf Lounge will feel like being close to the sea – white sand, cold beers, sparkling wine and ice cream. The bar in the beach hut with loungy music and cozy deck chairs will do the rest. Golfers live a longer and healthier life — this is a scientific fact. And in good company, you can be happy no matter how old you are. In the Golf Lounge Silver Club, you get a lot of fresh air and learn how to play golf at the same time. 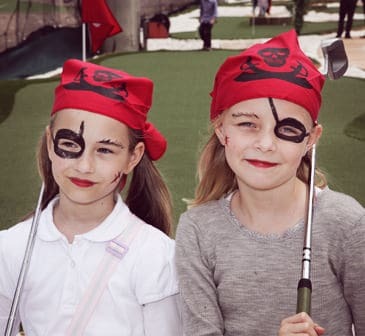 The birthday party with miniature golf, action & fun on the 6 hole “pirates course“, yummy lunch, drinks and cake – all-inclusive. You just have to take the ride to get to us. 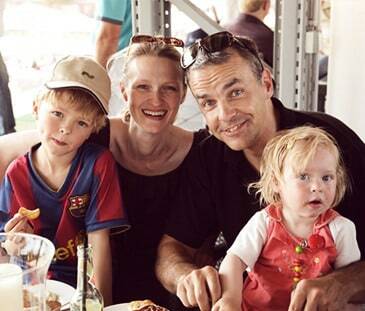 Parents can be part of the action or watch from a safe place at the lounge bar and patio. You want to hang out with the girls and need a nice and new spot? 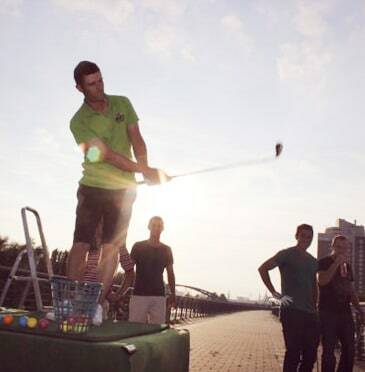 Check out a bunch in the Golf Lounge: The Lounge Bar is great for people-watching, the beach club offers cozy deck chairs and on the driving range you can practice your swing. On all floors, there are snacks and drinks available – from salad to bratwurst, from Aperol Spritz to draft beer. You want to have fun but your friends are on vacation? Just try out a new ball game. In our vacation camps over three or five days, you can play golf and meet other kids. 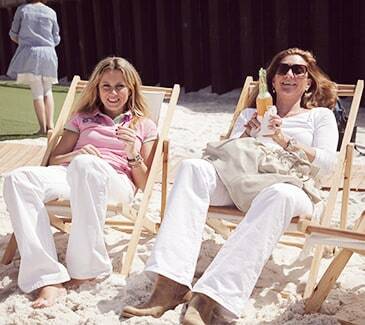 We keep your parents happy with coffee, cold drinks, good company and a nice Elbe view.